Dirty Bomb is an upcoming free-to-play, first person shooter for the PC platform from Splash Damage. Splash Damage is the studio behind titles like Brink, Enemy Territory: Quake Wars and Wolfenstein: Enemy Territory. You'll see in the gameplay trailer above that Splash Damage chose to leave Brink off of the brief list of games they created. It's a title that received a harsh lashing from both critics and fans upon release. One thing I noticed in the gameplay trailer was Splash Damage's decision to skip out on ironsights (EDIT: You can use ironsights! Missed it when I watched the clip. ), the ability to zoom down the barrel of every gun in your arsenal. This gameplay mechanic can sometimes spark debate amongst gamers. Some prefer the classic fire-from-the-hip method, others like being able to aim down the sights of each gun. Personally, when I'm gaming on a PC, I prefer the more classic approach over ironsights. Your field of view isn't compromised when firing from the hip, and the cursor provides a perfect context for where your bullets will fly. However, I will recognize that some players enjoy the added zoom of looking down the barrel of a gun. 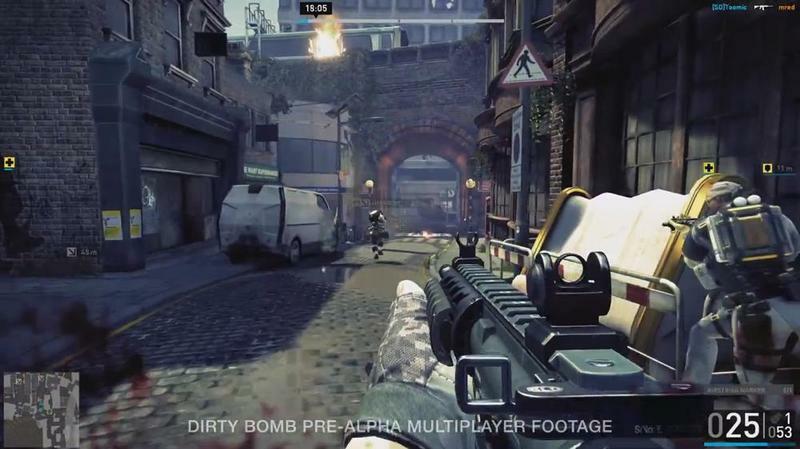 While a specific launch date has not been announced, Dirty Bomb is set to release in 2013. You can head to the game's official site now and secure your username. You can also buy into a few premium packages.